Check our Dining Guide for information on locations and meals. Hibachi is an experience within itself, but pairing it with world-class roller coasters and a location just steps away from your hotel room creates a perfect trifecta of entertainment. Take a seat at the table and be prepared to feel the heat of the show. Serving up Japanese favorites, including entrees of chicken, steak and fish, the chef will prepare the food in front of you in the authentic hibachi style. Feeling something on the lighter side? Sushi is the perfect Japanese cuisine to satisfy a craving for something fresh. Keep an eye on the knives and sake because you never know what the chefs have up their sleeves. Before you know it, you have a plate full of food and you don’t remember how it got there. 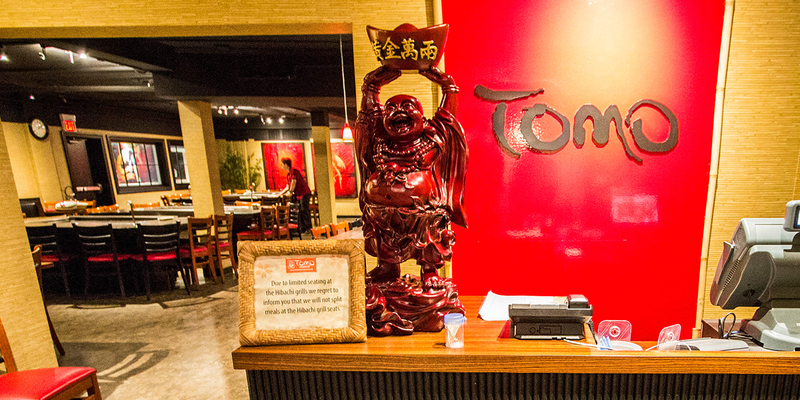 Located in Hotel Breakers, TOMO offers a retreat to park and hotel guests, so gather your friends for a very unique dining experience. Just remember when exiting the park, you must get a hand stamp for re-entry. When you purchase an All Season Dining Plan, it will automatically be uploaded to your season pass. Simply present your pass at any participating locations throughout the park and enjoy lunch and dinner (with only a 4 hour interval between meals) every time you visit. Drinks are not included. However, you may purchase a All Season Souvenir Bottle or Season Pass Drink Plan online for free refills all season long. Simply redeem your voucher at any participating locations for an entree, side, and a fountain drink. Guests with All Day Dining will receive a wristband at any of the participating locations and enjoy an entree and side as often as every 90 minutes! Drinks are not included. However, you may purchase a Souvenir Bottle online at our best price when it goes on sale soon. Guests with All Season Dining will automatically have it included on their Season Pass. Simply present your season pass at any of the participating locations throughout the park and enjoy lunch and dinner (with only a 4 hour interval between meals) every time you visit. Drinks are not included but you can purchase a All Season Souvenir Bottle or Season Pass Drink Plan and enjoy free refills all season long. May be purchased at the park&apos;s ticket windows. Or, save yourself time and purchase All Day Dining online before you go to the park. Add the All Season Dining plan onto your Season Pass and stay fueled for the fun all day long. All Season Dining includes lunch and dinner at participating locations throughout the park every time you visit during the season. Does not include drinks, but you may consider buying a Souvenir Bottle online. With a Souvenir Bottle, enjoy free refills all day long on your first visit and $1 (tax included) refills for the rest of the season. Does not include drinks, but the All Season Souvenir Bottle or Season Pass Drink Plan are great money-saving options that feature free refills all season long. Please refer to our 2018 Dining Guide HERE to view last year's Dining Plan options for each location. Information on 2019 Dining Guide coming soon. As a Platinum Passholder, the All Season Dining Plan and All Season Souvenir Bottle are valid at any Cedar Fair park within the U.S. and Canada. Simply present your Platinum Pass at any participating food locations during your park visit to enjoy lunch and dinner (with only a 4 hour interval time between meals) and free refills with your Souvenir Bottle or Season Pass Drink Plan.